Sgt. 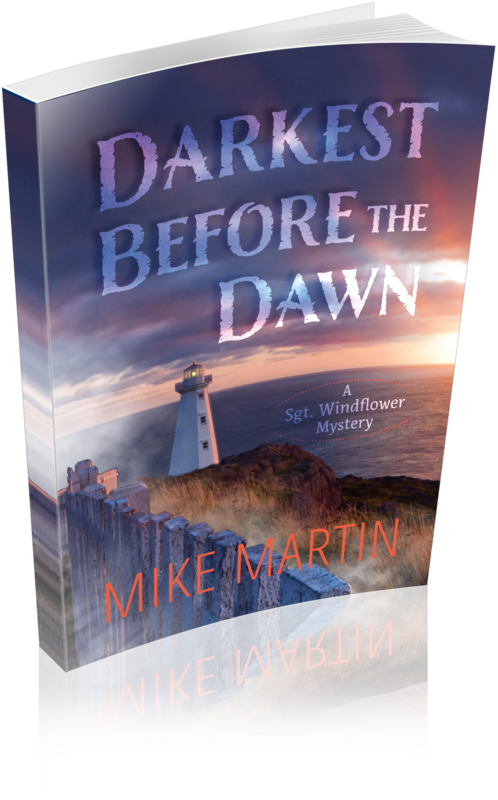 Winston Windflower, an RCMP officer and a Cree from northern Alberta, is enjoying an idyllic life in the small town of Grand Bank, Newfoundland when a mysterious and very dead body washes up on a nearby beach. Windflower feels right at home with the rich culture, food and history of this part of the world. But his world is shaken by a series of events that threaten his new-found happiness. And it all starts with the discovery of The Body on the T.
The Body on the T is set in the small town of Grand Bank on Newfoundland’s southeast shore. The T refers to the shape of the formation of the jutting neck of land on which a body has just been found. An unknown man has $20,000 sewn into his jacket and was hit hard enough to break the back of his skull before he went into the water. The plot thickens and becomes more complicated from there. However, after a large drug bust, all ends well. Nevertheless, there is more than the plot that make this book a good read. The characters are lifelike, especially Sgt. Windflower, a northern Cree and a Mountie by profession who practises the religion of his ancestors. Other memorable characters are Sheila, his girlfriend who runs a restaurant called the Mug Up, Cpl. Tizzard, and two East Indian doctors. Other aspects of the book include descriptions of delicious meals, vivid scenery and short accounts of episodes in Newfoundland history. Although the book needs proofreading and the writing is no more than decent, it’s to be recommended. As the second in a proposed series, we very much look forward to the third. With the lousy publicity the RCMP has been attracting in recent years, it might consider an ad campaign built around Sergeant Winston Windflower of the Grand Bank, Newfoundland, detachment. Windflower is the most conscientious Mountie since Dudley Do-Right and quite a bit more alert. He’s diligent, loyal, diplomatic and a Cree by birth. In Martin’s second Windflower novel, the principal police business puts our hero up against a gang of drug smugglers. But the book draws its most tense and poignant passages from a crisis in Windflower’s personal life that tests his Mountie mettle. Jack Batten’s Whodunit column appears every second week. Joyriding in a red Challenger, playing chicken with a moose on a back road outside Grand Banks, Newfoundland. That sets the tone. Everyone and everything are minutes away. All the faces you meet, you know. The Body on the T captures life’s moments of joys and seconds of crisis. RCMP Sergeant Winston Windflower contends with a body washed ashore, with feeling his way into a new culture, with love and death, with a rogue officer on the lam and a secret mission. The Body on the T is a story of life’s teeter-totter, hard landings and gentle recoveries, all told with passion and the absence of language so often deemed essential to stories of crime and resolution. Don Graves lives in Burlington and has won an award for his Spectator reviews of Canadian mystery novels. If crime and cod tongues, down-home romance and East Coast hospitality are your thing, well Mike Martin’s second novel The Body on the T is for you. Martin, a native Newfoundlander, has a real flair for bringing out the charms of The Rock in the sea. The novel is also a good guide to what is happening in contemporary Newfoundland society since the collapse of the cod fishery and the advent of offshore oil. The Body on the T is a sequel to Martin’s first novel, Walker on the Cape. In both novels, his main character is Sergeant Winston Windflower of the Royal Canadian Mounted Police. But Martin’s novel are much more that the Mountie always get his man story. Windflower, a Cree from Northern Alberta, sees Newfoundland’s society from quite a unique perspective and falls in love with the small town of Grand Bank, as well as with the stunning owner of the Mug-Up café, Sheila Hillier. His idyllic existence in running the small RCMP detachment is disturbed by two drug-related homicides. Windflower is soon pulled into the intrigue of the bigger picture by Inspector Arsenault, who recruits Windflower to put an end to the largest drug-running operation on the Eastern seaboard. Don’t expect though a fast-paced Body mystery thriller in Body on the T. That is definitely not Martin’s style. Instead, just sit back and enjoy the author’s ability to endear his main characters to his readers and teach them just a smidgeon more about Canada’s most colourful province. With two books to his credit, Mike Martin is well on his way to establishing himself firmly in the company of Louise Penny and other Canadian crime writing heavyweights. Oh by the way, if you are wondering what the “T” is, you will just have to buy a copy of the novel and turn to page three to figure out that bit of Newfoundland trivia. Sgt Winston Windflower is enjoying his posting in Grand Bank. He has a growing relationship with the owner of a local diner, a few good friends in the community, and very much enjoys the Newfoundland community where he has been posted. Things become a little less idealistic when a body is found on the beach, there is a second murder, and Windflower is asked by his boss to help bring down a drug smuggling operation. When tragedy hits close to home, Windflower has to carefully balance his personal and professional life. The Body on the T is an excellent, lightweight mystery. This may sound pejorative to some but it is certainly not. The story is told in a straightforward, economical way that allows the reader to just enjoy the experience. Sergeant Windflower is an original and interesting character and Martin has surrounded him with a supporting cast that is just as interesting. The many little moments of local colour and history not only add to the flavor but also make a reader want to go and visit Newfoundland or buy the first book in the series.